This comprehensive volume demystifies the process of clinical hypnosis, and it takes the reader through the process of hypnotherapy sessions in a simple and easy to understand manner. 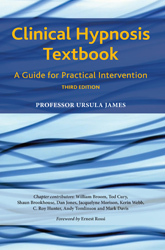 It offers practical suggestions on identifying the best approach to take: setting objectives for therapy; constructing a session and finally evaluating the outcomes. This edition also includes chapters from specialists in varying approaches, and encourages the reader to recognise the significance of the individual in the therapeutic process. Used as a textbook in 10 UK medical schools, it is now required reading for the MSc in clinical hypnosis at Robert Gordon University, Aberdeen. An excellent introduction for all health professionals, or to enhance sessions construction for experienced medical hypnosis practitioners. If you are interested in how hypnosis works and would like to learn self-hypnosis, or if you are studying the subject, or if you already use it in your practice, this book should be your essential guide. The skills taught in this volume include how to utilise hypnosis for personal use as well as in the professional setting, and incorporates highly portable communication skills as a basis for increasing the accuracy of diagnosis. "...clarified many of the queries I have had..."
A Kindle version of this book is available here.